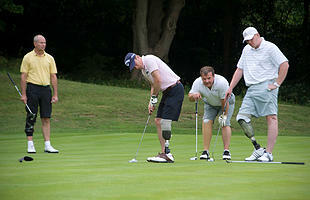 This is a great opportunity to play golf with On Course Foundation Member Mike Browne at the exclusive St. Georges Hill. Mike's story is truly inspirational - from golf newbie to professional golfer, to winning the South African Disabled Open Championship in 2018. Regarded by many as Harry Colt's crowning glory, St George’s Hill Golf Club has been one of England’s most revered Clubs since 1913. Situated in the heart of Surrey’s heathland, the Club sits within an exclusive private estate, creating an idyllic ambience and sense of wonderment. The undulating fairways, heather, silver birch and stately Scots pine are ever-present across the three loops of nine, each hole individual, leaving an indelible impression on all who visit.